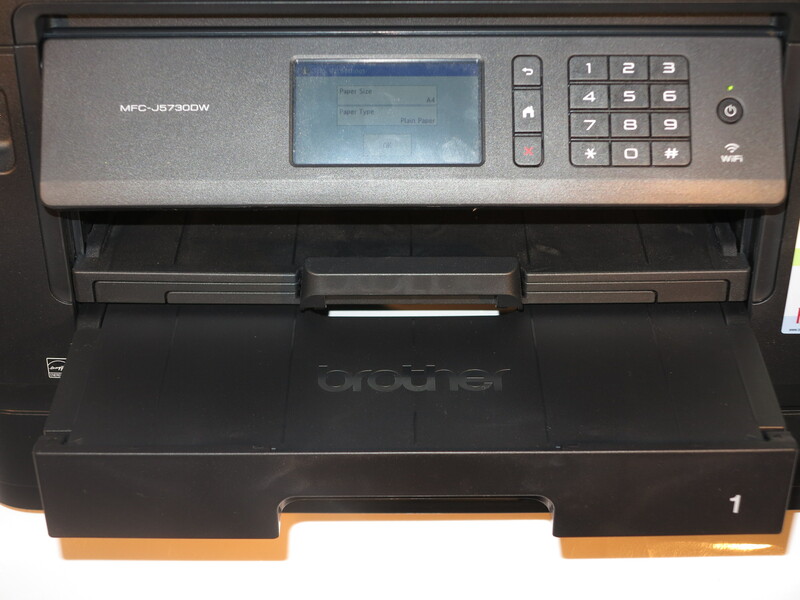 I am reviewing the Brother MFC-J1300DW INKVestment colour inkjet multifunction printer. This is Brother’s attempt at a high-ink-capacity approach to inkjet printing where there is an ink tank for each colour. But, unlike Epson who use separate tanks that are filled from a bottle, they use cartridges which hold some of the ink and the ink is transferred to a holding tank before it is used. There is the Brother DCP-J1100DW which doesn’t have the fax ability and may be an economical path. Luckily it has the automatic document feeder which is of importance if you do want to scan or copy multiple pages at once. The printer can be connected directly to the host computer using a USB cable. But it can be connected to your network via Ethernet cable or Wi-Fi wireless. This supports the ability to directly enter your Wi-Fi network’s passphrase as part of a wizard-based setup routine on the control panel. Like with most of Brother’s inkjet printers, the cables for the USB or Ethernet connection are snaked in under the scanner platen which may be seen as being awkward for a newcomer. The Brother INKVestment approach offered by the MFC-J1300DW inkjet multifunction printer is based around high-capacity cartridges that offload ink in to tanks integrated in the machine. This is based upon a continuous-inking approach that Epson and others use for their “tank-based” printers but uses the simplicity associated with cartridge-based printers. It meant that there were no special procedures needed to be performed to get the printer up and running. Being a compact printer, the Brother MFC-J1300DW uses the traditional portrait feed-through method that most inkjet printers use. As well, it has a small A4 paper tray for storing paper, but this can be a limitation if you expect it to print a large job. There is a low-profile automatic document feeder that works as expected and can come in handy for copying or scanning multiple pages or sending a fax. There is support for Brother’s cloud-driven Web Connect functionality. This includes cloud-hosted scan-to-email, a fax-vault function with the ability to receive faxes to email or online storage, amongst other things. A problem that can appear with “walk-up” scanning directly to removeable media is that the pictures don’t come out with a similar kind of quality that you would expect if you scan to a regular computer. I had noticed this with a project where I was to scan some pictures for broadcast use and found that you can’t determine the level of JPEG compression for pictures stored to the removable medium. This could be rectified through the use of an option to determine the JPEG compression level for SDXC cards or large-capacity high-speed USB devices along with support for USB 3.0 for the “walk-up” USB interface. There is a USB port and SD card slot for printing photos from memory cards but this function is very limited. It doesn’t support DPOF printing where you can set up a print order on your camera, nor does it support PictBridge printing from your camera. As well, I could only see the first 300 pictures on an SDHC card that has 1099 pictures on it available for printing. What seems to be happening is that the user class who value the high-quality digital cameras is being forgotten about when it comes to walk-up printing functionality. The Brother MFC-J1300DW is able to work as a Super G3 fax machine but doesn’t support T.37 or T.38 IP-fax endpoint abilities. It may not be seen as an important feature except for some professions like the legal and medical profession who do rely on fax transmission of documents. This is augmented with a “fax vault” function that allows received faxes to be forwarded to an online-storage service like Dropbox or an email address, but this function requires forwarded faxes to be printed locally by the machine as they arrive. I would personally require this forwarding-to-online-storage function to have an option of not printing faxes successfully forwarded to online storage. This would be of value for out-of-hours fax reception in an environment where there is a risk of confidential faxes being seen by the wrong eyes. It could also use an SSD or SD card as an alternative to these options where you don’t want confidential material on an online service or via an insecure email setup. I have installed the drivers from Brother’s Website for this printer on to both my Windows 10 computer and a friend’s Macintosh running one of the newer versions of MacOS which was to be used by them to scan some photos. Here, the driver-installation procedure went according to plan for both platforms. I used my Samsung Android mobile phone to print out an email using the Mopria driver-free printing protocol and this setup worked properly via the home network. Here, the Mopria subsystem discovered the printer properly and turned out the document as expected. The print speed was very typical for an average inkjet printer that uses the orthodox printing arrangement rather than the newer landscape printing arrangement. Here, it still turned out a sharp document for each print job I had sent to it. I kept an eye on how this printer handles two-sided printing, especially when it comes to any “drifting” between the front and back of the page. There wasn’t any of that issue with this machine which would make it work properly with desktop-publishing jobs involving oddly-shaped documents like bookmarks or hang-tags. I have test-printed two photos on to photo-grade paper and have found that there is the sharpness and definition in the images. The pictures do come out bright but the colour saturation could be improved slightly especially when handling reds. I have scanned some photos with this printer and have found that there are problems with handling high-contrast photos especially if they are the kind of snapshot prints you get from a minilab. It may be a problem associated with most consumer scanners especially when it comes to reflective material. This baseline home printer could be improved upon through the use of landscape printing. It is more so if the goal is to make this class of home multifunction printer more compact. As well, it could benefit from a “mezzanine” photo-printing tray like what the previous Brother home MFC printers offered along with having a deeper paper tray so you can have a larger amount of paper on board. Having a higher-capacity paper tray can exploit the INKVestment system further by allowing for larger print runs to be fulfilled. Here, it would work well towards the end of school or college / university semesters where there is the likelihood of large assignments being printed out, whether at a proof-reading stage or for handing in. Similarly, having the output tray as a separate item that is integrated with the printer rather than being attached to the paper tray can make the printer easier to load. This could also allow Brother to innovate further by designing an output tray that automatically extends when a print job is about to be turned out and retracts when the documents are removed. Most of these Brother printers could support SMB or HTTP-based scanning to or printing from network and Internet resources. A feature like that could make more use of NAS systems as a digital document archive. Similarly, Brother could maintain interest in the standards associated with walk-up printing of digital images from cameras , be it PictBridge wired connectivity or DPOF removable-media-based print orders. This would earn its keep with printing out “there-and-then” prints of photos you took with your digital camera. 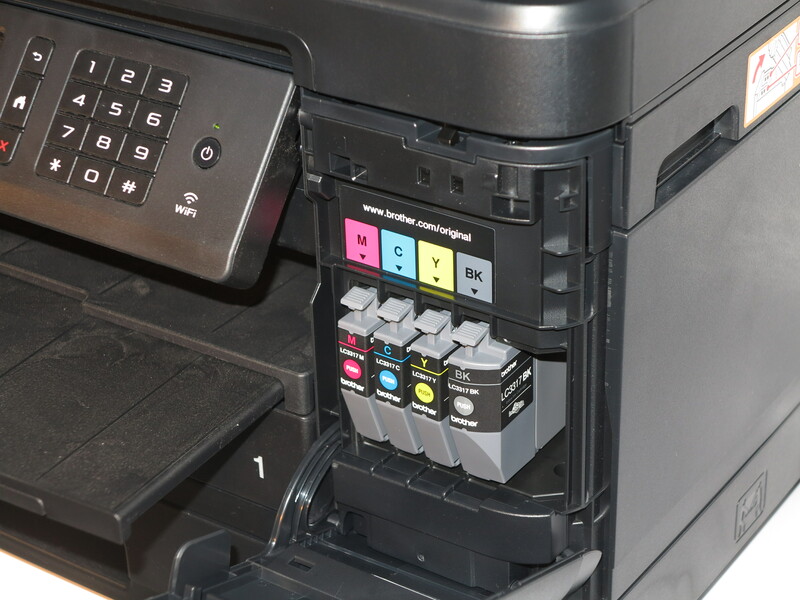 A question that can easily crop up with the Brother “INKVestment” approach is the cost of buying replacement ink cartridges at a later time like after that promised year of use. 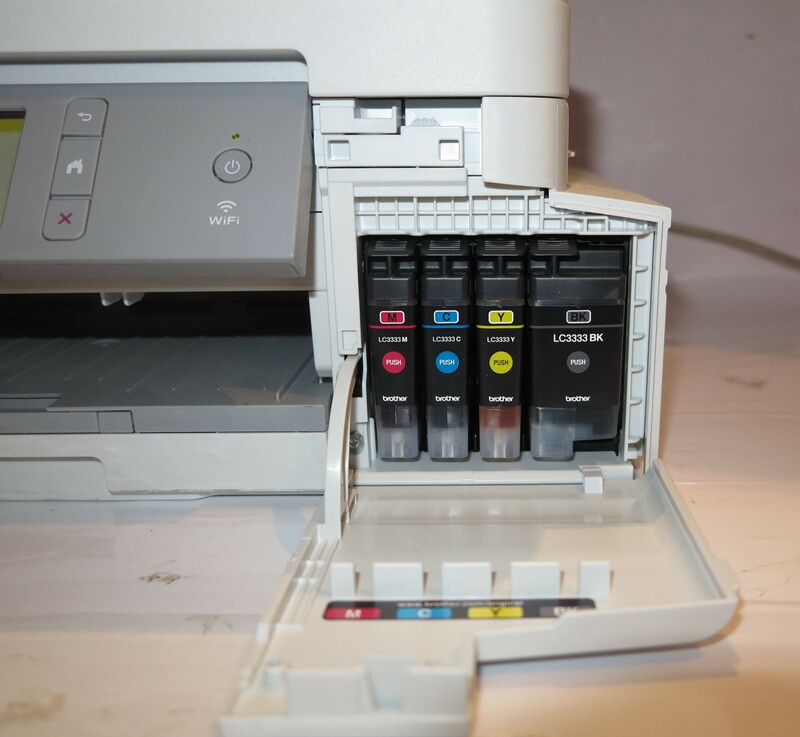 Here, it will be about whether it would be cost-effective to buy newer cartridges for the printer or simply to replace it with a machine of similar standard. But I have found that the cost to replace all cartridges on this printer wouldn’t be more than the initial purchase price of this machine, thus it doesn’t appear to be “disposable”. Similarly, using the tank approach in the INKVestment system could allow for the ability to replace empty cartridges while there is ink in the tank so as to cater for heavy print runs. This could be facilitated through the use of an indicator that shows whether a cartridge is empty while there is reserve ink in the tank. Even an option for higher-capacity cartridges can come in handy where there is a situation of peak usage. I expect that the Brother MFC-J1300DW INKVestment colour inkjet multifunction printer is being positioned as a general-purpose home or home-office printer with the focus on a long time between replacing ink. Here, I would see it work well as a multifunction printer to be kept in a study or similar location and handle a typical household’s print requirements. There are sure steps being taken to print fully-formatted documents from a computing device without the need for driver or companion software to be installed by the user. It is to allow a person to print a document like a boarding pass using the printer local to them without worrying about make or model it is in order to install any drivers. This effort has been focused towards mobile platforms like iOS and Android thanks to the inherently-portable nature of devices that run these operating systems. But there are other use cases like dedicated-function devices such as set-top boxes or accessible-computing scenarios where you use specially-designed hardware for people with particular challenges. But it can apply to regular computers, especially laptops that are likely to be taken from place to place. Apple facilitated this through integrating AirPrint in to the Macintosh platform since MacOS X 10.7 Lion so you can print to an AirPrint-compliant printer without needing to install drivers on your Mac computer. Now Microsoft is using the Mopria Alliance technology to enable this kind of driver-free printing from Windows 10. This is facilitated through a class driver baked in to the operating system since the October 2018 feature update (Build 1809). The class driver is offered as an option of last resort if Windows 10 cannot find the device driver for a newly-installed printer through existence on the host computer or through Windows Update. You can still install and update vendor-supplied driver software for your printer, something you would need to do if you want to exploit the scanner abilities on your multifunction printer or use advanced monitoring and quality-control abilities that the manufacturer offers. It would work if you are in a foreign place like your business partner’s office and you needed to print out a document “there and then”. In the case of managed-IT scenarios, the Mopria approach avoids the need for inhouse or contracted IT personnel to install drivers on the computer equipment they are managing to have it work with a particular printer. It also applies to task-specific Windows 10 builds where you want to have the minimum amount of software on the device yet allow for printing. As well, creating a standard operating environment or a dedicated-function device based on Windows 10 code like a point-of-sale system can be made easier especially where you want flexibility regarding the printer equipment you deploy or your end-users end up using. I would like to see Microsoft improve on this by having a standalone Mopria class driver available for prior versions of Windows and ready to download from their download sites. This is especially useful for organisations who maintain task-specific standard-operating-environments or devices based around these earlier operating systems. What is happening is the idea of driver-free printing is being seen as a reality especially for mobile computing scenarios and all the popular operating environments are coming to the party. 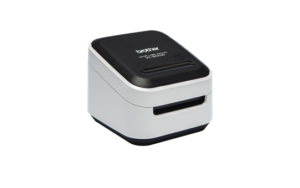 Brother is offering to the European market the VC-500W compact thermal label printer as a full-colour label printing solution. It is being pitched at applications like colour-coded labels, labels with multi-colour company logos or employee/visitor security badges that use full-colour photos. In the UK, Brother were even pitching the printer not just as a business tool but as part of home-based craftwork and hobbies – think of labelling those jars of marmalade, jam or other preserved fruits you make and give as gifts. It is while some of the other printer brands are releasing at least one model of full-colour compact label printer using inkjet printing or some other compact full-colour printing technology. The question about full-colour small-form (label / receipt / ticket) printing is whether it is a real business tool or simply a toy, especially where the technologies will become initially expensive to buy and use. This label printing system is based on the ZINK thermal printing system that Polaroid developed in the 1990s. But ZINK was mainly used for compact photo printers and digital cameras with integrated printers in order to share hard-copy prints of digital snapshots “there and then” like with Polaroid’s instant-camera legacy. Here, this used the direct-thermal printing process but uses the heat-pulse length and intensity to bring up particular colours. A question that can be raised about the use of ZINK technology is how long the printed labels will keep their same colour before they deteriorate. It also includes whether how long unused rolls of the ZINK-based label tape for this printer can stay unused before they print below par or jam up in the label printer. 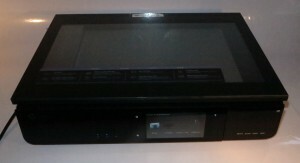 This printer uses the P-Touch software for regular Windows or MacOS computers or uses a special colour label-printing app for iOS and Android. It can link to the host computer device via USB or Wi-Fi whether directly or via an extent Wi-Fi network. It can work with a range of label widths up to 50mm and each label roll comes with 5m worth of full-colour label tape. Brother could also take the ZINK technology further by implementing it in A4/Letter page sizes to create a highly compact mobile colour printer of the same ilk as the “PocketJet” mobile printers. Here, the issue of long-term archiveability for ZINK-based colour printouts would have to be tested for it to have business value. But it could be considered acceptable for applications where full colour is required in transactional printouts like work quotes. As Brother slowly releases the VC-500W full-colour label printer around the world, it could be a chance to prove to home and business users real use case for full-colour small-form printing rather than it just being a toy. 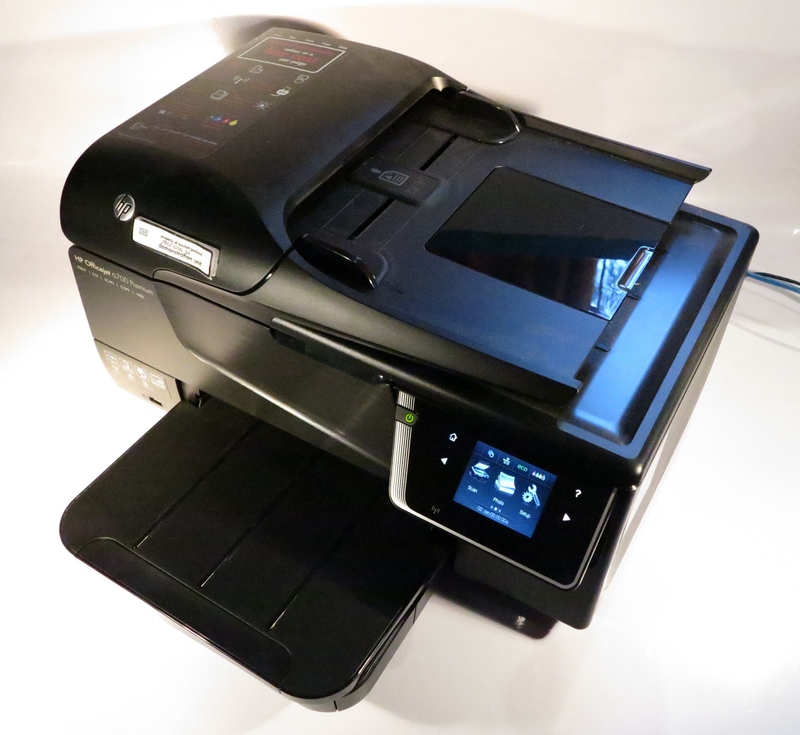 HP to implement a bug bounty program to assure high-quality secure firmware for their printers like thisi OfficeJet. Over the last few years, dedicated-function devices like printers, videosurveillance cameras, routers and the like have been identified as a weak point when it comes to data security. This has been highlighted through some recent cyberattacks like the Mirai botnet attack which was driven by dedicated-function devices like videosurveillance cameras running compromised firmware along with recent security exploits associated with home and SOHO routers being able to run compromised firmware. There is also the fact that manufacturers are building the same kind of computer power in to these devices as what would be expected from a regular computer through the 1990s or 2000s. There is also the fact that these devices can be seen as an entry point in to a network that handles confidential data or be used as an onramp for a denial-of-service botnet. Hewlett-Packard have answered the reality of firmware integrated within their printers by starting a bug-bounty program where software developers, computer hackers and the like are paid to “smoke out” bugs within this firmware. Then this leads to meaningful software updates and patches that are sent out to owners of these devices, typically through an automatic or semi-automatic installation approach. It is a similar practice to what Microsoft, Apple and others are working on to make sure that they are running high-quality secure operating-system and application software. This has been seen as of importance for printers targeted initially at the enterprise market because they would be processing significant amounts of company-confidential data in order to turn out company-confidential documents. But this approach would have to apply to home, SOHO and small-business machines as well as the larger workgroup machines found within the enterprise sector. This is because these kind of machines can be used by people working at or running a business from home along with those of us in charge of small businesses or community organisations. By HP setting an example with their printer firmware, it could become a standard across other vendors who want to maintain a culture of developing high-quality secure firmware for their dedicated-function devices. This is more so as the consumer and enterprise IT market raises expectations regarding the software quality and security that affects the devices they use. I am reviewing the Brother QL-1110NWB wide-format network label printer which is the premium model for Brother’s QL-1100 series of wide-format label printers. It is seen as something that can work with applications where barcodes, graphics or extra details like weights and use-by dates are to be placed on a label like with packaging or commercial-kitchen food management. There are two machines that are part of the Brother QL-1110 Series label printer lineup – the QL-1110 and the QL-1110NWB. The QL-1110 can only connect to the host computing device via USB and also supports USB-host connectivity for HID-class USB barcode readers. Android users can use USB OTG or USB Type-C adaptor cables to connect their devices to this printer and print using the Brother apps. Both of these machines run from AC power using an integrated power supply where you are not dealing with a “wall-wart” or “power brick” to supply power to them. Rather you are simply using the same kind of AC cord that you would use to power a portable radio and that leads towards a cable you can easily replace if the original one goes missing. 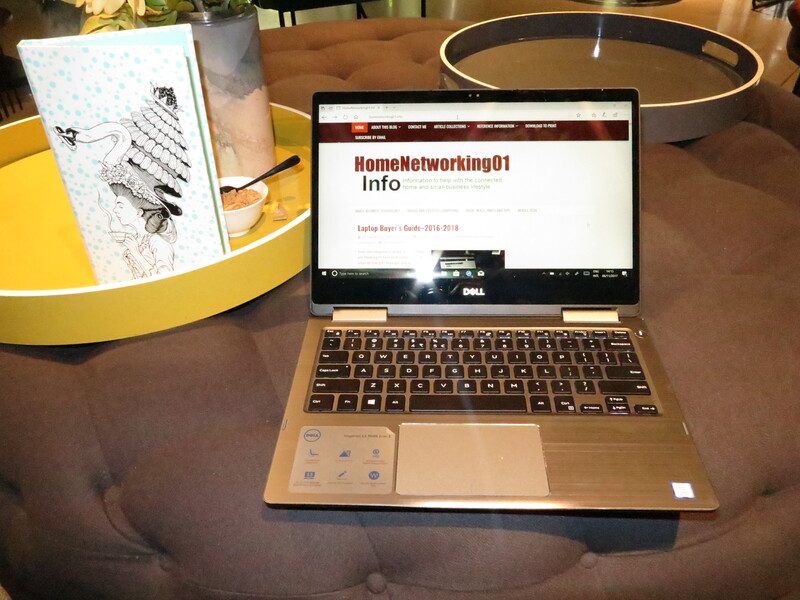 The Brother QL-1110NWB can connect to your network via Ethernet or Wi-Fi wireless as well as being able to print from mobile devices using either Bluetooth or Wi-Fi Direct connections. 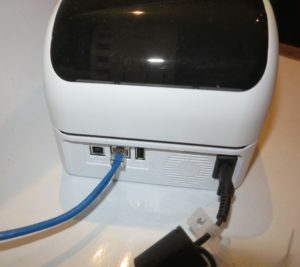 But if you are setting up this machine for Wi-Fi-based network connectivity, you have to connect it to a regular computer running Windows via USB and run the supplied Printer Setting Tool to configure it. This doesn’t apply if you use WPS “push-to-connect” Wi-Fi setup or Ethernet connectivity on a small network. I had found that the Printer Setting Tool was not surefire in its approach for Wi-Fi network setup and couldn’t even get it connected to my home network. But I could simply plug it in to the Ethernet connection which can be of use for setups where your premises is wired for Ethernet or you use a HomePlug powerline setup. There is support for Web-based configuration but this only applies if you have it connected to your network. It also supports Apple’s AirPrint driver-free printing standard so it can work with iOS and MacOS hosts without needing driver software. Personally, I had found that the Brother QL-1110NWB label printer yielded a surefire connection when I used it with an Ethernet connection or a USB direct-to-host connection. The label printers also have an integrated guillotine which makes it simpler and more elegant to manage the labels. This works under programmatic control or you can cut the labels manually through a push-button on the machine’s control panel. The Brother QL-1110 Series label printers can take the same standard-width label stock as the rest of the QL series reel-feed label printers. But they can take label stock that is wider than normal thus allowing for the creation of larger labels including the possibility of printing out standard name-badge or address labels in landscape form. Loading any of the Brother QL-1110 Series label printers is a relatively simple chore no matter whether you are using the wide label stock or the narrow label stock. These label printers use a clamshell design and you release the lid by operating two latches at the same time, which doesn’t require much pressure. Then you drop the label reel in, making sure it engages with the ridge on the right hand side of the compartment. Then you thread the label paper through the machine taking care to make sure the paper is under a black sensor box on the right side of the compartment while it emerges through the front. Here, there is very little effort needed to make sure that the paper is threaded properly. The Brother label printer uses microswitches that sense mouldings and holes on the reel along with other microswitches that sense the width of the reel to determine what kind of label tape is in the printer including whether it is a wide-format label tape. Here, you would have to be careful that the correct label tape is on the correct reel if you want this unit to work properly. A systems integrator or yourself could upload label template designs created using P-Touch Editor and set up a “computer-free” label-creation arrangement for data read from barcodes. This can work with an HID-compliant barcode reader connected to the USB host port (both models) or linked via Bluetooth (QL-1110NWB only). That setup would then appeal to stock-control and similar applications. There is also support for ESC/P printing codes so that these label printers can work with other third-party labelling or similar software that implements this kind of output control. All the Brother label machines including these units support the P-Touch Editor software which works as a quick way to turn out labels. If you use a smartphone or mobile-platform tablet, the Brother iPrint&Label app works in the same vein for turning out labels from these devices. If you use P-Touch Editor, you could set it that way by selecting “Vertical” in the Orientation setting under the Paper tab. This means that it will print out parallel to the printer. Here, I would recommend this if you want to exploit the wide-format label tape for turning out address labels or name badges. Similarly, Brother could look towards the use of other USB or Bluetooth input devices like keyboards or digital scales as a way to enter data for use with stored label templates. Here, it could work well with environments where you can’t use a smartphone or regular computer to enter data for a labelling environment. I have always called on Brother to add a “measuring-tape” creation function to their P-Touch Editor software. Such a function would allow someone to use a label printer loaded with continuous-tape label stock to create a measuring tape that could be stuck to something like a worktop edge or door frame thus making that surface something to measure length or height with. This feature would appeal to laboratories, the medical profession, child care, education or a whole host of other professions who are always measuring things like people’s height for example. As well, the P-Touch Address Book software could support country-specific addressing better by using nation-specific address layouts or omitting the ZIP Code barcode for non-USA addresses. It could be taken further through the implementation of machine-readable barcoding techniques that other countries may use to improve mail delivery. The Brother QL-1100 Series label printers have become an example of legitimising wide-format thermal-based label printing for small businesses. This would be of importance for logistics and inventory-management applications where there is requirement for more detail on the label or to make heavy use of large barcodes. But I would recommend the Brother QL-1110NWB specifically for those setups where you expect the printer to be located away from a regular computer. Epson have previously released a range of piezo inkjet printers that implement their own continuous-inking system. This feature, known as EcoTank, has large-capacity tanks installed on the side of the printer and you add more ink to the machine’s ink supply by topping up these tanks from bottles of ink that Epson makes available. Here, the idea is to do away with the need to frequently replace ink cartridges when they run out. But now they have refreshed this product lineup with all but two of the low-end models being equipped with auto-duplex printing. They have now taken things further by releasing the ET-16500 EcoTank multifunction which prints both sides on A3, Ledger or Tabloid paper and scans both sides of an original that is of any of these paper sizes. This printer, which sells in Australia for AUD$1599 also offers the expected multifunction abilities like copying or G3 PSTN colour fax functionality. It also supports Google Cloud Print and can work with the Epson Connect Web / mobile printing subsystem, with it connected to your home or small-business network using 802.11g/n Wi-Fi or Ethernet technology. It can turn out print jobs at a rate of 18 pages per minute according to the ISO standard and has two 250-sheet trays to hold the paper. 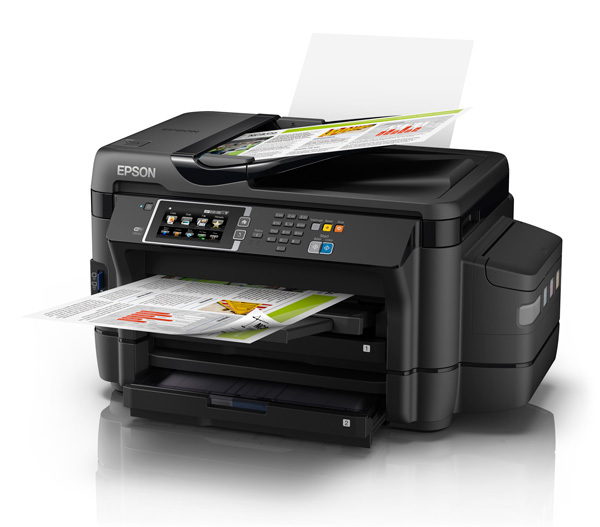 As well, the inks and printing system that Epson use are intended to give a quality equivalent to most laser printers. Let’s not forget that the ink tanks in this model are ultra-high-capacity to allow for increased printing of A3 or similar paper sizes. 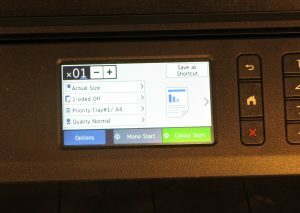 Some of these features may tempt you to buy the printer and see it serve as your organisation’s small office-based printing press. But there are certain questions regarding output-tray or ink-tank capacities along wiht the time to print both sides of a page which can call out the issue of having this machine serve as that small-run printing press. On the other hand, you could simply focus the Epson towards signage, short print runs and the like as part of your promotion strategy especially where it has the high-capacity ink tanks and the EcoTank continuous-inking system. 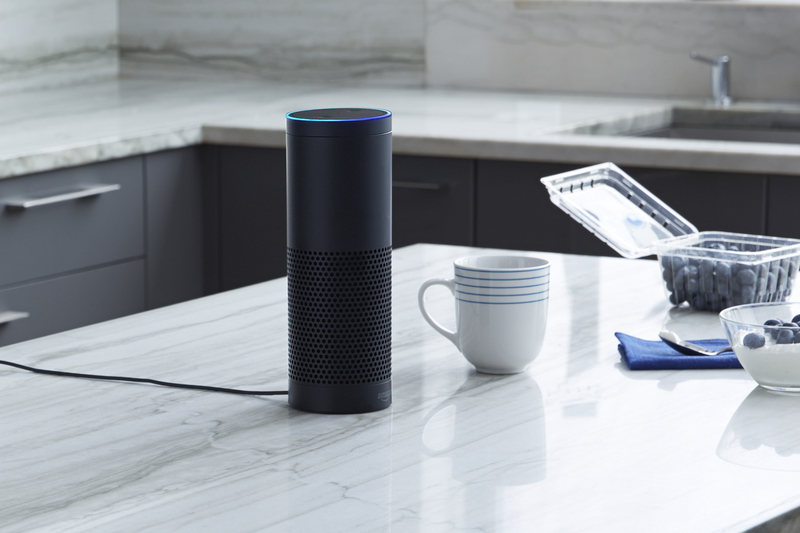 You can now ask Amazon Alexa to print “download-to-print” resources or other material through your ePrint-capable HP network printer. 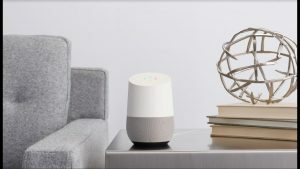 This was a feature initially and quietly offered for Google Home and Microsoft Cortana but HP have given it a lot of space on Amazon’s voice-assistant platform due to it becoming the most popular of these platforms. With all of these platforms, the printing function has to be added on as a Skill through the respective platform’s app store. As well, the printer must be able to support HP ePrint or Web Services printing, which enables printing of various printable resources from various content providers as well as supporting “email-to-print” where you can send a document to a machine-specific email address for it to be printed at that machine. Infact I have given some space to the HP ePrint ecosystem through reviewing a number of HP printers that have this functionality as well as writing some articles on this subsystem such as implementing it in a public-printing concept. For this functionality to work with your printer, you have to supply its ePrint email address to the Skill as part of configuring it. 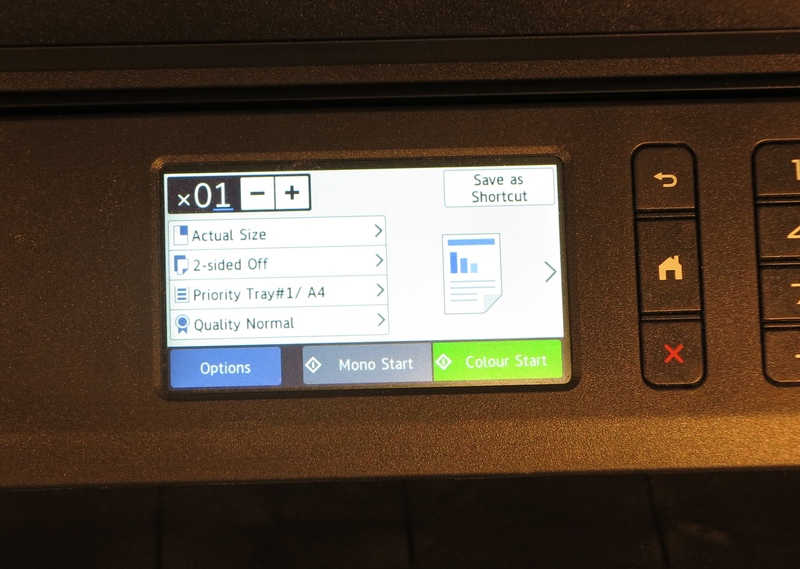 Another limitation is that you can only bind one printer to that Skill which can be a limitation with multiple-printer households, especially where you may choose to run an HP Envy 100, Envy 120 or similar machine as a secondary machine kept in the kitchen. Once this is set up, you could ask Alexa to print out something like an art-therapy colouring page or some ruled paper and your network-capable HP printer will turn these out. What is still happening is that HP is still showing strong committment to the idea of the home or small-office printer being a highly-capable appliance rather than just a peripheral for a regular computer running a full-blown operating system. This means that the host device shouldn’t need to be dependent on a print driver to suit that particular machine. 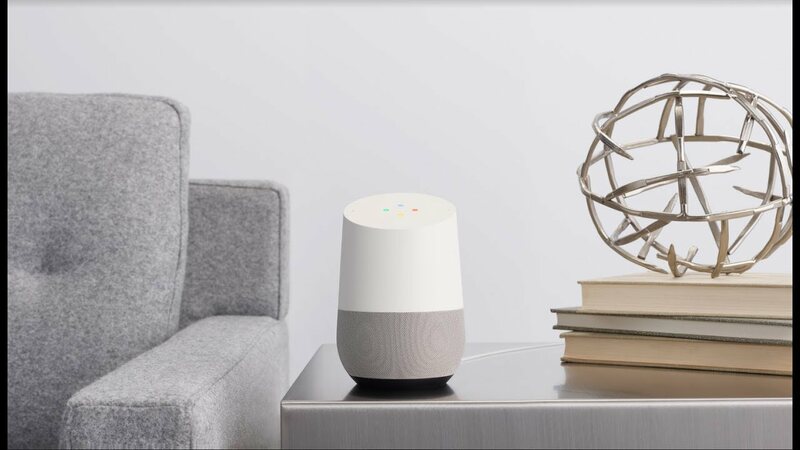 This committment was demonstrated through HP’s network-capable home printers and MFCs having UPnP Printing, then establishing the ePrint ecosystem with its email-to-print and print-from-the-control-panel functions, and now using your smart speaker to order documents to be printed. What needs to happen is that other printer manufacturers show a strong committment towards home and small-business printers being able to work as a “printing appliance” rather than just as a computer peripheral. and running a polished “scan-to-email” and “enail-to-print” ecosystem. Similarly, having other dedicated-purpose devices like Smart TVs, games consoles and the new crop of smart appliances being able to print to these devices without the need for particular software drivers. Then it could see these devices become highly capable and as part of the smart-home ecosystem. I am reviewing Brother’s latest approach at a light-duty monochrome laser multifunction printer in the form of the MFC-L2713DW. It is one of these machines that you could use for a small office or shop, especially if you are intending to replace a light-duty fax machine. Some of you also may see this machine or its peers as a routine document printer for your home office. It may also appeal to professionals and the like who want to have a light-duty document-focused printer or fax-capable multifunction in their office as a “private” machine while their workplace has a heavy-duty multifunction in the common areas. I had connected the printer to the home network via Ethernet and this meant that I could effectively be “on board” very quickly. As far as I am concerned, I really wouldn’t use the Wi-Fi ability on these printers to connect to an existing network because you may have Wi-Fi issues in your home or small-business location, rather I would connect via Ethernet or HomePlug AV powerline. 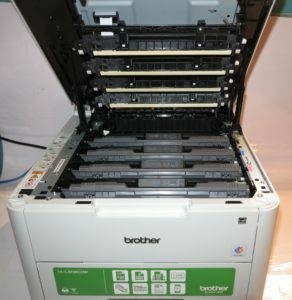 This printer, like the other small monochrome laser printers that Brother offers, uses a separate user-replaceable drum unit along with the toner cartridge rather than following HP’s path of an integrated print cartridge that has the drum unit. 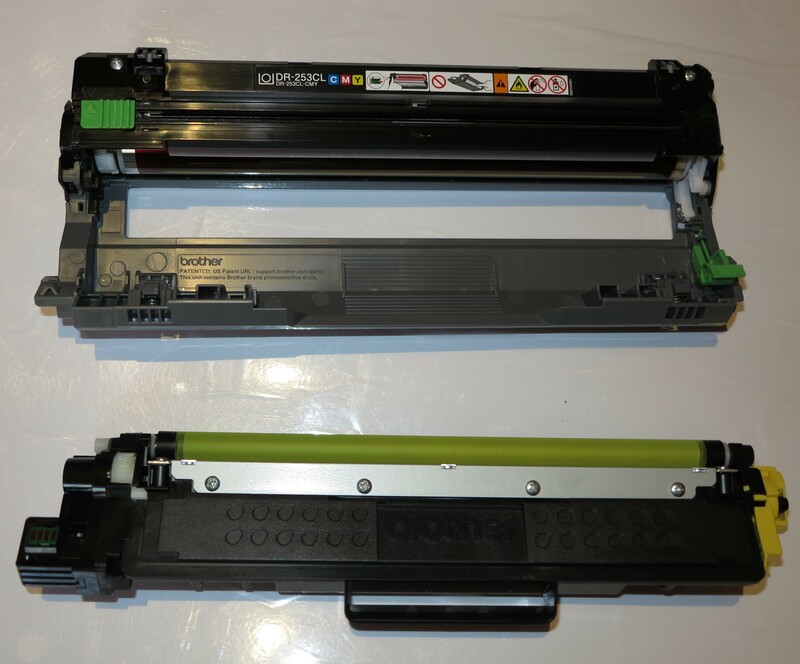 But if you have to add toner to the printer, you have to remove the drum unit from the machine before you detach the spent toner cartridge from the drum unit. Here the installation process was simple enough to do. But I also like the way Brother offers a higher-yield toner cartridge for these printers, a feature I definitely applaud for people who want to choose the right yield to suit their needs and budget. Like with most of Brother’s budget-priced and value-priced printer models, this printer uses a single-page bypass feed which would be limiting if you are running multiple-page print jobs that use special media. This would also be used if you are dealing with pre-printed forms such as when a doctor is turning out prescriptions or test / treatment referrals. Personally, I would like to move away from the single-page approach towards having a five-page approach to cater for jobs where a handful of pre-printed forms or label sheets are being turned out. The A4 paper tray worked properly and didn’t feel flimsy to the touch, making it a machine that can satisfy most users. 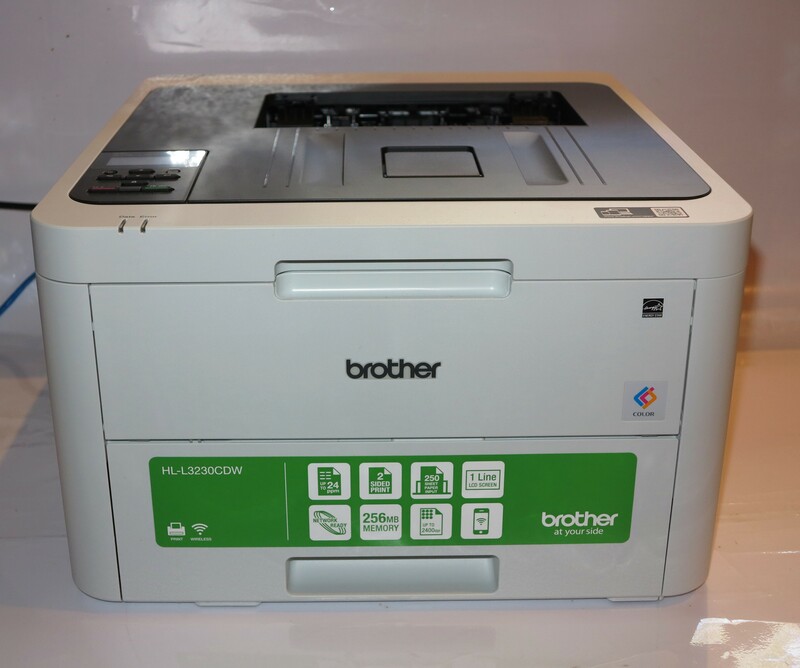 The Brother MFC-L2713DW has an on-machine with a bright text-based LCD display and rubber-feel keys. Here, the text-based LCD display is a high-contrast “black-on-white” type which makes it very readable under many different lighting scenarios. But I would like to improve on the D-pad’s design by using illuminated arrow legends that come alive when you are using the menu options. The copying process for a single page fed through the automatic document feeder came through as being very quick even when the machine wasn’t used for a while. Here, by the time the document left the ADF, the printer was turning out the copy. The quality of the copies came out good for documents printed on plain paper but I wouldn’t expect a high-quality copy for photos or similar material. It also holds true for material printed on glossy paper such as ID or business cards whereupon you may find that the copy comes out paler than the original. The Brother MFC-L2713DW can serve as a basic monochrome phone-based fax machine with a limited-capacity “fax vault” function suitable for overnight / weekend use. Here it omits the T.37 email-based store-and-forward fax functionality which may be an approach for some of us who want to move towards IP fax. Most likely, when you move towards an IP-based telephony service and use an analogue-telephony-adaptor with machines like this one, you may be also setting up for T.38 real-time Internet fax. 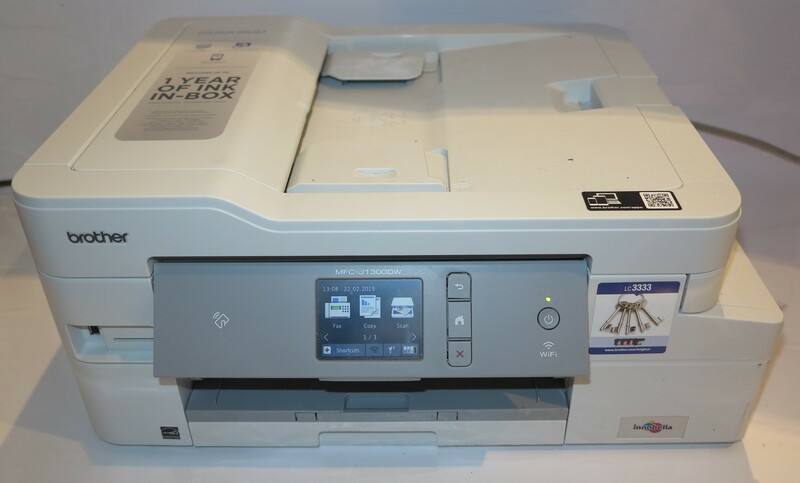 Like with all of the Brother MFC-series fax-capable multifunction printers that have duplex printing, you can set this machine up to print the faxes it receives on both sides of the paper as a way to save on paper. I had installed the drivers on my Windows 10 computer from Brother’s Website and they were in place very quickly. Here, you would have to install the full software set to enable printing, scanning and fax management including “print-to-fax” functionality. The ControlCenter4 scan monitor does take time to come in to action when you start a scan-to-computer job from the printer’s control surface. This is a continual problem with most of the scanner software offered by most scanner and MFC manufacturers and, personally, I would like to see the host computer’s operating system look after this functionality for both direct and network setups. As far as mobile devices were concerned, the Brother MFC-L2713DW worked properly with the Android print-service plugin that I installed on my Samsung Android phone. Here, the app was quick to recognise the printer’s capabilities and have the document turned out quickly. Of course it does support Apple AirPrint for those of you who run your business from an iPad. The Brother MFC-L2713DW came alive and started printing documents very quickly, whether from the computer or a mobile phone. It also led to a quick turnout of the document, something very similar to most of the small monochrome laser printers. The printer was able to handle a double-sided print job but it doesn’t turn them out as quickly as a simplex print job. This is something you would notice more with light-duty monochrome lasers that have this functionality. It turned out these documents without jamming or dropping pages. The Brother MFC-L2713DW does satisfy the output-quality requirements for a small entry-level monochrome laser printer. Here, it would yield clear easy-to-read text that would be part of an office document. But I wouldn’t expect it to yield high-quality output when it comes to photos and similar presentation-grade work. Here I noticed banding along the narrow edge of the sheet when I printed out a picture of a landscape, but it was able to maintain proper fidelity when it came to the image’s contrast. A feature I would like to see continual improvement on for the Brother small laser printers is to have auto-duplex printing with a speed similar to simplex printing jobs. Similarly, I would like to see Brother move away from the “single-sheet” approach for the manual bypass function on these printers so as to cater for multiple-sheet print runs using special stationery. A feature that could benefit this class of light-duty monochrome laser multifunction would to permit “two-machine” copying across the network. 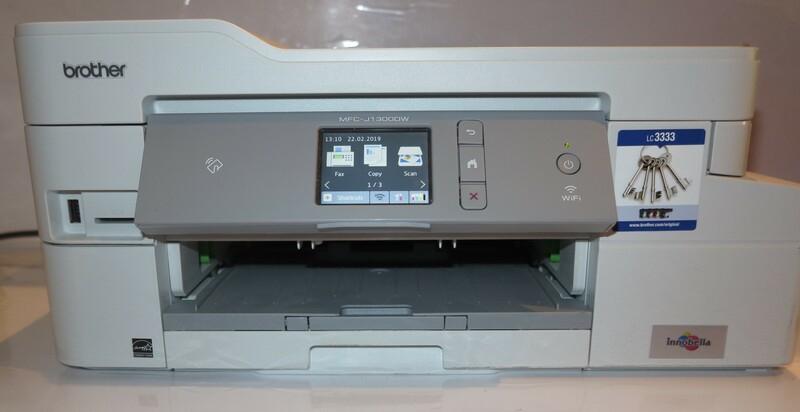 This is where you could scan a document on a multifunction like this one and it is then printed out on a colour printer or multifunction connected to the same network. 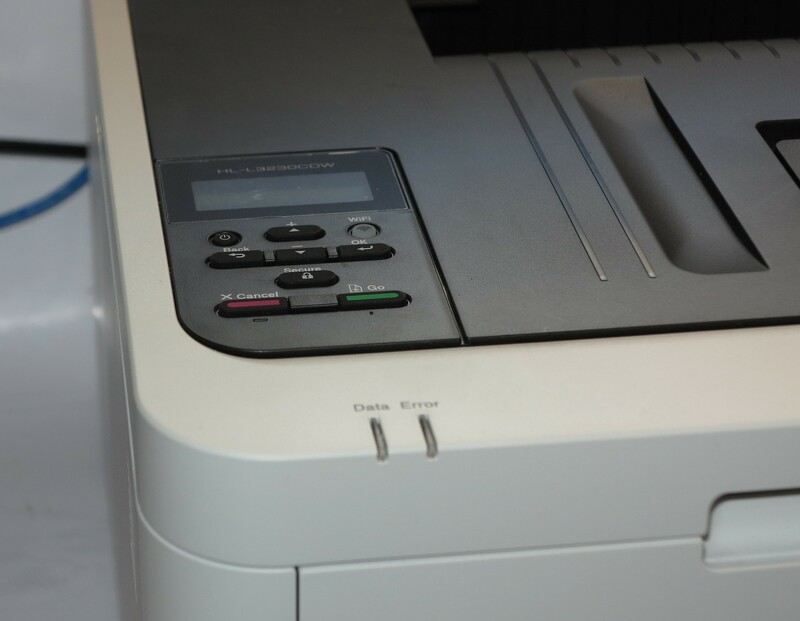 This would also allow for other applications like enlarging documents to A3 / Ledger with the A4 / Letter or smaller original on a machine like this and the large A3 copy emerging from an A3-capable printer or multifunction. This feature could make use of setups where you have multiple document machines with complementary capabilites whether in page size, printing type or colour / monochrome printing. As well, the Brother MFC-L2713DW and its peers could benefit from at least SDXC card storage to provide enhanced fax-storage functionality such as to cater to busy workloads, large documents and the like. Brother could also work towards creating a T.38 IP-fax endpoint functionality in their fax-capable multifunction printers and push the telecoms industry to lead towards simplified provisioning for this technology. Similarly, Brother could exploit the separately-replaceable drum unit approach that applies to their laser printers by providing heavy-duty variants of these parts as an upgrade option. This would please users who buy laser printers suited for their current duty levels but install heavier-duty parts in them if they are faced with a heavier workload. I would position the Brother MFC-L2713DW monochrome laser multifunction printer as an economy-priced office printer for workplaces that don’t have a heavy document throughput. This would also include it serving as a “private” document printer / copier for a professional’s or manager’s office or simply as a document-focused multifunction for a home office. Here, it would earn its keep as a replacement for a small inkjet multifunction that is used just for turning out documents or a small plain-paper fax that uses thermal-transfer printing. I would also see it as a direct upgrade for an economy laser printer or multifunction that isn’t able to do duplex printing. 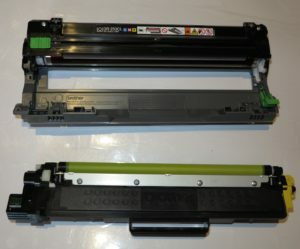 I have also compared the price for the Brother MFC-L2713DW against the price of replacing its drum unit with the genuine replacement part and found that it is worth buying that part rather than replacing the machine with one of the same standard and functionality level when it comes up for replacement. Update: I have updated the prices to the manufacturer’s recommended retail prices for the consumables. 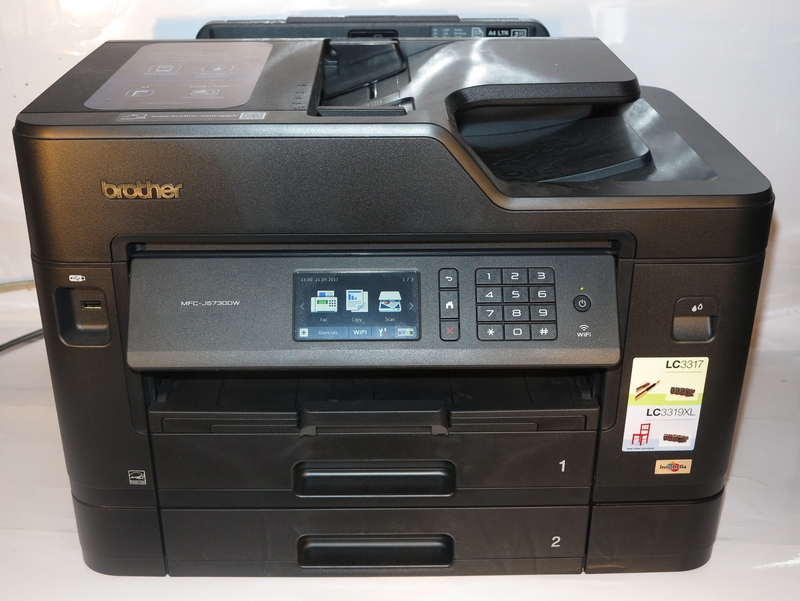 I am reviewing the Brother MFC-J5730DW multifunction colour inkjet printer which is part of Brother’s newest generation of colour business inkjet printers that follows on from the MFC-J5720DW that I previously reviewed. 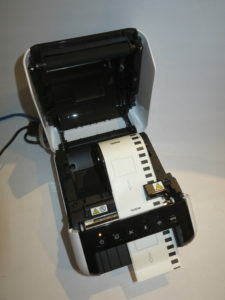 There is a cheaper model in this lineup, known as the MFC-J5330DW that has a single A4/A3 tray, a paper bypass feed that only handles one sheet, doesn’t come with the single-pass duplex scan, and has a smaller user-interface screen But this printer uses the same high-capacity ink cartridges and is able to print to A3 using that same landscape-printing technique. Unlike the Brother MFC-J5720DW, the Brother MFC-J5730 doesn’t convey the sleek looks that make printers of this class attractive. Here, the unit is styled in a more conventional approach that is very similar to Brother’s laser multifunction printers with the control panel keyboard that you use for entering numbers very similar to most other office-grade printers. This may be more user-friendly for those of us who are confused with touch-panel keyboards that light up on an “as-required” basis. The printer can connect directly to your computer via a USB cable. But it can connect to your home or small business network using Ethernet or Wi-Fi wireless that supports most connection setups. It can even create its own Wi-Fi access point which just exists for printing and scanning, but I personally would like to see the ability to be its own access point to “extend” coverage of a wireless network with this feature able to be disabled by management IT along with supporting “business” access point requirements. The network functionality is future-proof in that it supports IPv6 addressing, a real requirement as we run out of public IPv4 network addresses. 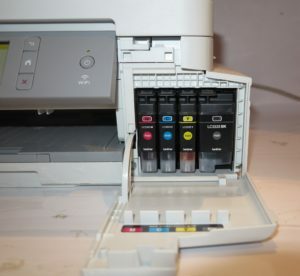 Like all of the recent Brother inkjet printer generations, the cables for the USB or Ethernet connections is snaked in under the scanner rather than being connected to a socket on the back of the printer. The same holds true for the phone and line connections that you would need to use if this machine is being used as a fax. The setup experience is very similar to the previous Brother printers but this is improved thanks to the larger LCD display that the printer is equipped with. Some of you may find that the black-on-white display which is implemented in this generation of printers may be a bit awkward to use when working the menus. The Brother MFC-J5730DW implements the same paper-feed options as its predecessor model that is: to use two paper drawers up front as well as a bypass feed slot on the back of the printer capable of handling many sheets of paper. These drawers can be extended out so you can load A3 or Ledger paper in the machine, but they leave the paper exposed, which can cause it to attract dust, thus leading to unreliable operation. Here, Brother could answer this problem by integrating a larger slide-out flap in each of these trays which comes out whenever you load the tray with larger paper sizes. Printed documents end up on a separate output shelf rather than one that is integrated in one of the paper drawers. This makes the job of topping up the paper supply in that drawer easier because you are not having to extend or collapse the output shelf. The ability for the Brother MFC-J5730DW multifunction inkjet printer to print to A3 or Ledger paper from either the bypass feed or any of the paper trays. This has been due to Brother implementing the “landscape” paper feed for the standard document sizes. This means that the print head works along the long edge of the paper and has allowed for documents to be printed very quickly while allowing for a relatively-compact printer design. The scanner’s automatic document feeder doesn’t share that same compact look as the previous generation of A4 business inkjet printers that Brother issued. Here, it looks like the automatic document feeder installed on Brother’s “full-A3” inkjet multifunction printers or their laser/LED-based multifunction printers. The other missing feature for this model is that the glass platen for manual scanning is still only able to handle A4 or Letter document sizes, where I would prefer these units to have a Legal-sized glass platen for documents that are on Legal or foolscap paper sizes. The automatic document feeder in this model implements single-pass duplex scanning but the paper path is still the “U-shaped” path which can be of concern when you are dealing with brittle paper like thin letter-writing paper. Here, it is a design limitation associated with scanners that are required to support manual and sheet-fed scanning, but could be improved upon by supporting a “two-way” feed setup. Like with the previous models, the scanner lid on the Brother MFC-J5730DW can be pulled up at the rear so you can scan or copy thicker documents but I would like to see this improved upon by allowing you to lay the multipurpose feed tray flat so you can easily position thicker originals further up the back. The Brother MFC-J5730DW only supports USB-connected media like USB thumbdrives or SD card readers for local data storage. This can be a limitation if you deal frequently with digital photos, where I would like to see it support PictBridge “direct-from-camera” printing or printing from SD and CompactFlash cards. 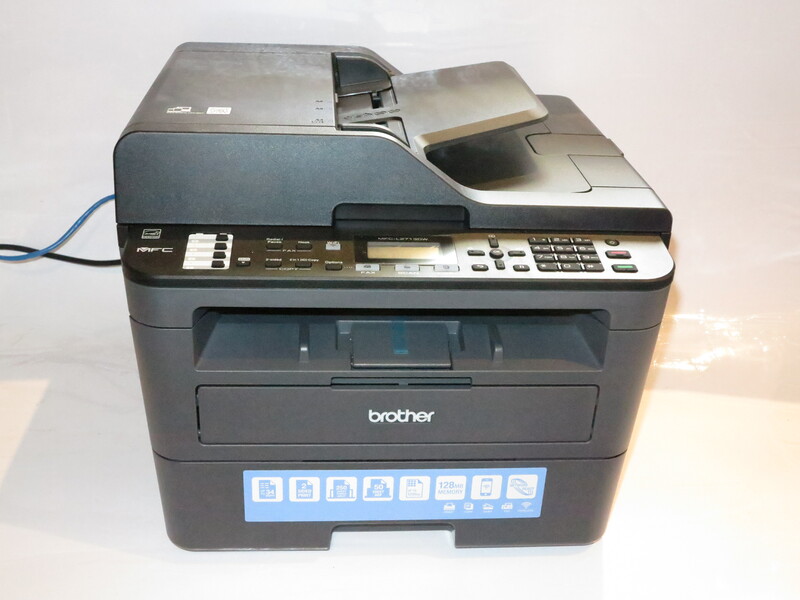 You also have the Brother MFC-J5730DW able to work as a capable up-to-date colour fax machine with T.37-compliant email-based Internet fax functionality. This includes the fact that Brother MFC-J5730DW offers a “fax-to-cloud” feature for standard faxes where incoming documents can be forwarded to a folder on an online storage service as soon as they arrive. This offers an Internet-based “fax-vault” functionality so that the machine isn’t printing out every fax that comes in, making it easy for others who have access to your office like contract cleaners or night-shift workers to be snooping on your confidential incoming faxes when you are not there. This is also in conjunction to being able to have faxes forwarded to a fax number or email address or sent to your regular Windows computer, functions that Brother had offered for handling incoming faxes. Speaking of cloud services, Brother offers access to the common online services for scanning and printing. This means that you could print a photo from Facebook, a document from Dropbox or scan a document to OneDrive for you to work with on your laptop. The cloud services also include the ability to print notepaper, graph paper, music manuscript paper and similar form documents, a feature that competing printer vendors have been offering for a while. But these documents can be improved upon such as simply providing the music paper without any clef markings so you could write manuscript for different instruments and ensembles. At the moment, Brother still supplies model-specific drivers for their printers rather than offering a monolithic driver that can cover a product range. This applies to the desktop operating systems although they offer a single piece of software for the mobile operating systems. A single piece of software that covers one or more product ranges could make it easier for those of us who standardise on a particular manufacturer’s devices to set a computer up for newer printers. But these drivers installed properly on my Windows 10 computer without throwing any error messages. They also provide the same “at-a-glance” dashboard that Brother uses for their printers. The print jobs had come through properly and reliably as would be expected. The scan software that Brother provides hasn’t been improved upon for a long time and could be worked on, especially in the context of “editing” multiple-page scans. Here, it could support the ability to do things like re-scanning a single page so as to correct scanning mistakes like skewed pages or “splitting” a scan job to two or more documents. The latter situation may be of benefit if you are using the machine’s automatic document feeder to expedite the scanning of multiple documents and would earn its keep with the Brother MFC-J5730 and other machines equipped with a single-pass duplex scanner. I have used this printer with my Android phone and it worked properly when I wanted it to print out an email attachment. This was using the Brother-supplied Android Print Services plug-in for the Android platform, but the printer can work with Mopria-compliant print-service plug-ins. Like most inkjet printers, the Brother took a similar amount of time to get going with the first page of the print job. But I have focused the print-quality tests in a way to show up the print quality offered by the new pigment-based ink setup that Brother implemented in this generation of inkjet printers compared to the previous generation machines. Here, this generation of business inkjet printers integrates the pipe-based ink-flow system, piezo-based printhead design and the pigment-based ink chemistry in to equipment designed to offer value for money at a price most people and businesses can consider. As well, I have allowed for a firmware update to take place to assess the print quality for these newer machines. The Brother MFC-J5730DW multifunction printer was able to turn out regular office documents very clearly and there wasn’t much difference in the quality of these standard print jobs. But when it comes to presentation-grade printing, be it a poster to put up on that noticeboard, a presentation handout to give to your attendees or a photo to put in your album, this is where the real tests show up. This also applies to those of us who use these printers to turn out inkjet proofs of documents we intend to have printed by someone else before we engage the printing service to have them printed. You may have to use the “vivid” setting in the printer driver to make sure that presentation-grade work doesn’t look dull, as I have tried with a noticeboard “tear-off” poster to promote this Website. But I have compared output quality for photo printing against the MFC-J5720DW which represents Brother’s previous generation of printers. Here, the photos came across with slightly more saturated with flesh tones coming across slightly more red compared to the previous model. This is a very similar look to what comes across with magazines or with most TV broadcasts where there is that stronger colour effect. What is happening is that Brother is pushing their business inkjet printers towards the same standard as the HP OfficeJet 8600a which was a printer of this class that was known for sharp vibrant presentation-grade image quality. As for scanning and copying, the Brother MFC-J5730DW had yielded a clear sharp image for the documents that were scanned. But it needed to be configured for the standard A4 paper size when you set up the scan software for working with most office documents if you are in Europe, Asia, Oceania and other areas where these sizes are normally used. This was because it was set up by default for the US Letter paper size, normally used in North America. Brother hasn’t yet rectified a problem that I find with copying or scanning from the glass platen. This is where the document edge is clipped by a few millimetres and can affect jobs where you deal with documents are printed “to the edge” like credit and ID cards or news clippings, but you want to align the document against the platen’s edge to avoid skewing. Brother could equip this printer with a Legal-size scan platen rather than the standard A4 / Letter platen. Here, it could cater towards situations where you are dealing with documents written on Legal-size or foolscap-size notepads which can be a reality when you are digitally archiving very old material. As well, they could support “to-the-edge” scanning so that documents that are placed against the edge of the glass aren’t clipped. Brother could make better use of the network connection on these printers so people can benefit from these connections especially where there is on-premises network-storage options available to that network. This is more so for small businesses and community organisations who may prefer to use a small desktop network-attached-storage system or file server in addition or in lieu of an online service for this purpose. For example, they could provide a walk-up print option that allows you to print documents that exist in a folder shared via your network or an Internet location using SMB, FTP or HTTP protocols using the machine’s LCD control panel. This feature could allow an organisation to create a “document library” or “stationery library” shared using an on-site server or NAS that has documents or pro-forma stationery which can be printed as required. This idea can extend to public Websites or organisation-specific intranet sites that host a collection of “download-to-print” resources. These “print from network” setups could be configured through the printer’s Web-based admin dashboard or through the printer’s control panel. There could be the ability to remember resource-specific passwords for network shares or Web pages that are protected with passwords or require the user to supply them each time they print documents from these resources while allowing for SSL encryption where applicable. Here, it avoids the need just to rely on Dropbox & co to provide these resources. 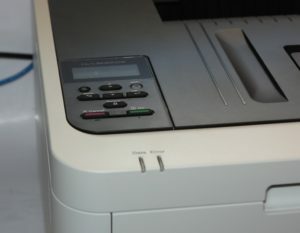 To the same extent, the Brother “MFC-series” fax-capable multifunction printers could use a network-shared folder to hold incoming or outgoing faxes for later printing or sending. Here, this can capitalise on the idea of a “fax-vault” used to assure confidentiality when it comes to inbound documents, or to allow an organisation who does a lot of overseas business to hold the overseas faxes to be delivered to the partners according to their “local morning” time. Similarly, Brother could support PictBridge camera-based digital printing for their business printers. 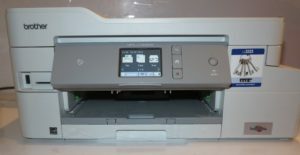 This is where you can print pictures from your digital camera using a suitably-equipped printer just by connecting the camera to that printer and using the camera’s control surface to print the pictures. Such a feature can come in very handy if you need to turn out “proof-quality” prints of the photos you had taken in order to show them to others. Brother can also use some of the neat-looking design aspects from the previous generation of business inkjet multifunction printers along with the new print-engine design to develop a range of consumer-focused A4/Photo inkjet multifunction printers that use the same consumables as these business printers. Here, these machines could be positioned as a secondary printer for the home network or as an entry-level printer for one’s home-computing setup. Similarly, they could offer a single-function A3/Ledger printer based on these printer designs to allow people to add large-sheet printing to their document-handling needs without having to replace their existing A4 multifunction that has served them well. Brother has just about achieved its goal in yielding a business inkjet printer that can excel with presentation printing as well as regular office-document printing tasks. This was more important for me where the goal was to see something answer HP’s well-known OfficeJet 8600 series of business inkjet printers when it comes to this task. As well, I placed importance on this feature with these printers due to the fact that the Brother MFC-J5730DW and its peers can print on A3 or Ledger paper, a size that yields very strongly with presentation-grade printing jobs. What the printer manufacturers need to do is to keep themselves interested in maintaining their business inkjet printer lineup as something that is about high-quality presentation-grade printing especially on A3 paper as well as turning out ordinary office documents. It can encourage everyone else in the small-business desktop printer game to compete against each other when it comes to presentation-level output quality as well as their equipment’s functionality. What it can lead to is companies like HP, Brother, Epson, Canon and others to keep a viable product class for machines that can satisfy small-businesses’ and community organisations’ small-run printing needs without losing the quality aspect. Here, I would recommend the use of the Brother MFC-J5730DW as an all-round small-run workhorse printer for a home office or other small office. This is more so if you expect to doe a significant amount of A3 printing such as to place posters on that noticeboard. You may be able to get away with saving money and buying the cheaper MFC-J5330DW if you rarely do A3 print jobs or don’t place value on double-sided scanning.